Next, youth visited the kitchen, where Firefighter Keith explained that firefighters cook and enjoy their meals together. Firefighter Brad quipped, “Not everyone here is allowed to cook.” Then youth went to the large garage where all the emergency vehicles and equipment is kept. Firefighter Eric dressed in full gear complete with an air tank, helmet and mask. “His voice voice sounds funny in there, doesn’t it,” said Firefighter Brad. “If there’s a fire and someone sounds like Darth Vader, that’s a firefighter coming to help.” Firefighter Keith explained that because of heavy smoke, a firefighter needs the air tank to breathe, and they will sometimes crawl on hands and knees to be able to see, and stay out of the thickest smoke. Kids were able to try on some of the protective equipment and discovered that it is very heavy and warm. The visit concluded with an in-depth tour of the fire engine, and each youth got to try their skill on the fire hose. Firefighters rolled out a miniature barn with flames on top. Each Club member shot the hose, aiming to knock down the flames. 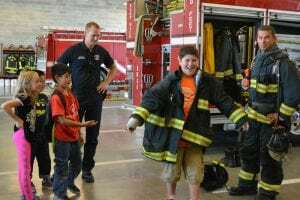 The Boys & Girls Clubs of Skagit County is grateful to the Burlington Fire Department for all the service they provide the community, and for taking the time to educate and visit with our Club members.